Get full colour sublimated jerseys for your cycling team. Our friendly customer service representatives will ensure every step is taken towards a great end product. Design your entire garment or ask to see our entire template collection. Colour is infused into the frabic using a special dye. It offers a smooth gradation of colours. The result is a lightweight garment with vibrant and continuous design. Get the best custom sublimated cycling jerseys from Artik! We're here to help you put your design onto custom designed sublimated cycling shirts for your team or charity event. From Design to Reality - Imagine Your Cycling Uniforms! 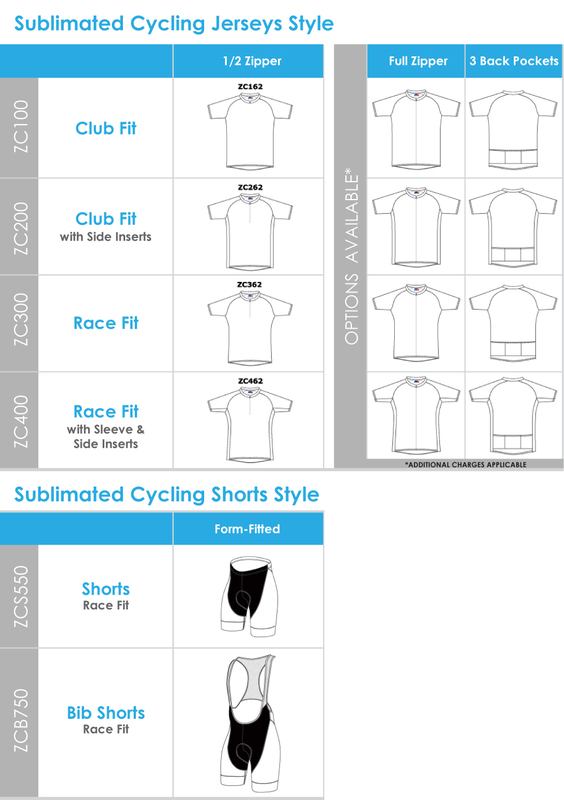 It all begins with your idea - what colours, designs and logos would you like on your custom sublimated cycling shirts? With sublimation, the sky is the limit! Imagine any design and we can create it on breathable material. At Artik, our friendly sales team will help you create the perfect custom sublimated cycling shirts. From creating your design, to choosing your uniform style to finding the best pricing, we're here to help! Our sublimation team is the best in the country, creating bold colours and all-over designs. Design your entire cycling shirt with patterns, colours and images of your choice! With sublimation, your cycling shirt's fabric is infused with special dye that won't wash out. You can add gradients, complex patterns, even images and they'll turn out perfectly through our digital sublimation process. Your cycling garments will be light, breathable and bold - perfect for the track or the streets. From professional racers to charity groups to cycling gyms to casual bike teams, we've sublimated custom bike uniforms for every kind of bicyclist on the road! No matter who you are, we're dedicated to creating top quality sublimated bike shirts for you, with bright colours and affordable pricing. Our expert staff will help find the right sublimated bicycle jersey for your team. At Artik, our sublimated jerseys come in multiple styles, shapes and sizes. Call our expert staff for help finding the right cycling jersey for your team. Our sublimated cycling shirts won't peel or crack over time and they've got the professional quality that pro cyclists rely on during long races and marathons. Our sublimated cycling shirts will stretch with your movements, breath with your skin and won't absorb sweat and moisture. The best part is, your sublimated cycling jerseys are fully customizable with full colour and all over design.